Xtan Ha “The Waterfront” Resort is a secluded getaway 7.2 miles north of San Pedro on a stretch of pristine white sandy beach with beautiful turquoise water. 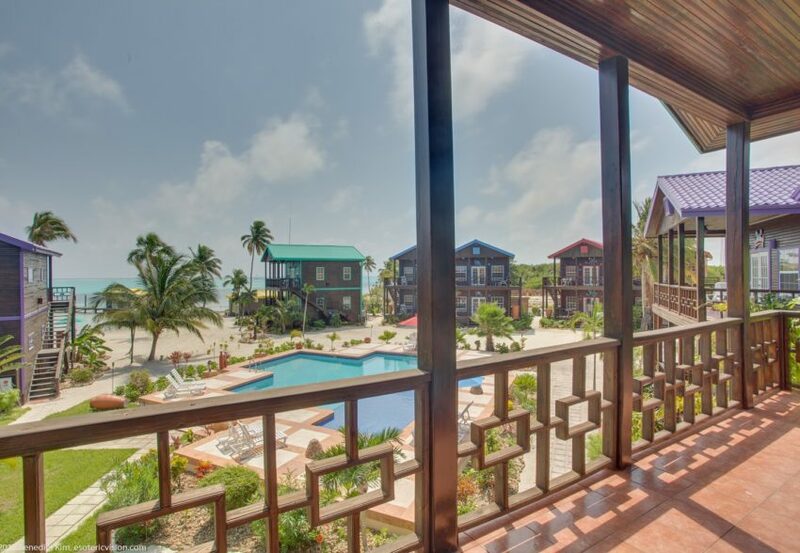 This Belize Hotel offers an open air-beach-front restaurant & bar, pool, dock, and Free Wi-Fi in-suites and common areas. The resort offers fully furnished one bedroom villas that feature a private veranda, fully equipped kitchenette, dining area, bathroom with shower, bedroom with Cable TV. Resort amenities include a swimming pool surrounded by lush landscaping, seafront palapa bar, full service excursion center, a mini business center with computer and internet access. Our full-service restaurant features American and Caribbean favorites for breakfast, lunch, and dinner. Beyond the sandy white beach and stunning turquoise waters, X’tan Ha (pronounced “ISH-tan HA”) offers endless opportunities for relaxation and fun. Xtan Ha has one of the finest beaches on Ambergris Caye, perfect for swimming and has a large over water trampoline and volley ball net in the water! The beachfront palapa bar has tables right in the water where you can sip on your Caribbean drink, stay cool, relax and have a romantic moment. Temple Run Beach Bar- Gather on the beach for your favorite tropical libation. Featuring a full-service bar, our beach bar is the place to be for fun and to mingle with other guests. Spacious one bedroom villa with pool view. All villas have a separate bedroom with king bed, private bathroom with shower only, kitchenette with microwave, refrigerator, 2 burner electric cooktop, coffee maker, and toaster. Villas also feature a dining room with seating for four, living room and private patio. 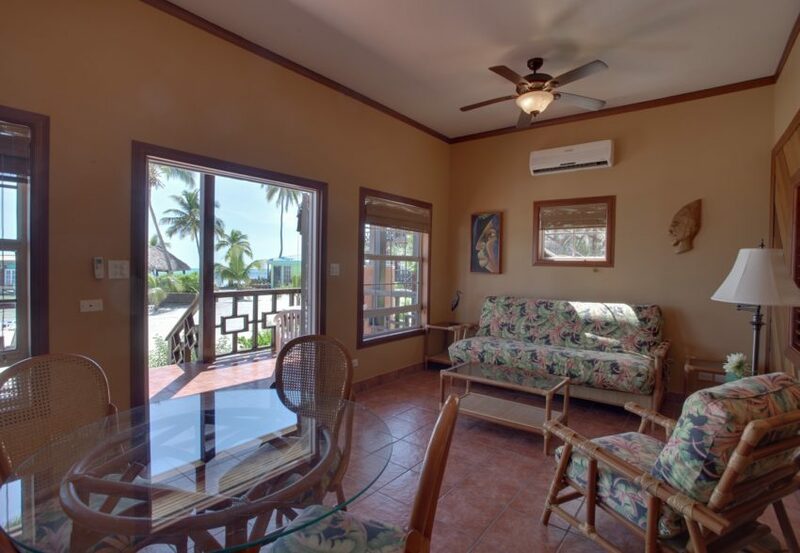 Each villa is centrally air conditioned and equipped with ceiling fans, and cable TV. Daily housekeeping is provided, laundry services offered and wireless Internet access is available onsite. Spacious one bedroom villa located directly seafront. All villas have a separate bedroom with king bed, private bathroom with shower only, kitchenette with microwave, refrigerator, 2 burner electric cooktop, coffee maker, and toaster. Villas also feature a dining room with seating for four, living room and private patio. 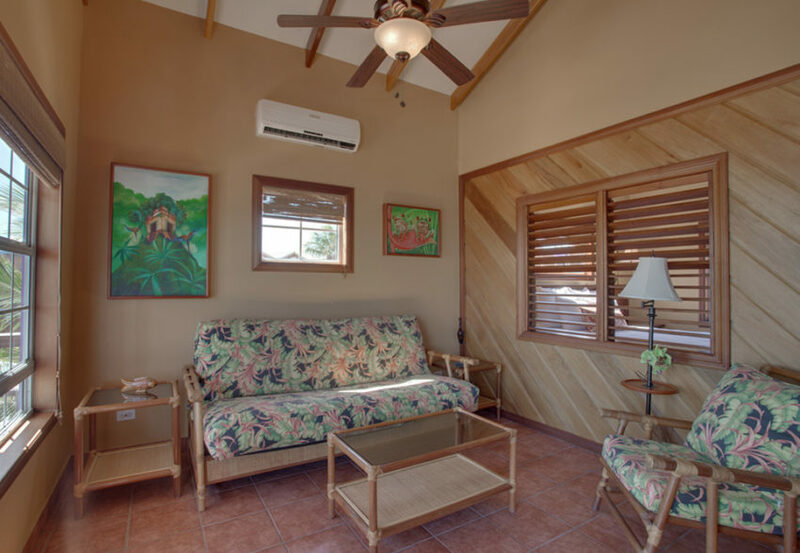 Each villa is centrally air conditioned and equipped with ceiling fans, and cable TV. Daily housekeeping is provided, laundry services offered and wireless Internet access is available onsite. Honeymoon Casita – These cozy units are each situated alongside our recently constructed Mayan Themed Pool and offer a delightful and colorful island vacation sanctuary for you to relax and enjoy the tropical breeze of the Caribbean. They provide a vibrant and bright living area, full kitchen, bedroom and bathroom with shower. Each Casita has a King Bed with cotton linens in the bedroom with a spacious clothing closet and your own private en-suite bathroom. 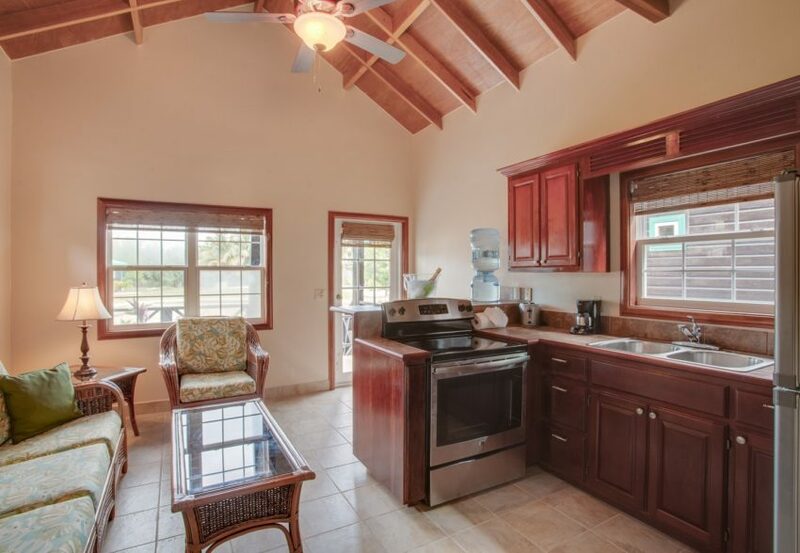 All Casitas full kitchen equipped with a refrigerator, microwave, coffee maker and stove/oven. Additional in-room amenities include an electronic safe for your valuables, a large cable TV , tableware, beach towels, and complimentary purified water. Our Garden View Villas are our largest units and are the only room types which feature two floors as part of the same unit. On the ground floor these villas all have a large living room area with a large flat screen TV, a full kitchen with stove/oven, coffee maker, refrigerator and all necessary utensils. On the upper floor the villa features a small den area with a small trundle bed which can accommodate up to 2 children. The bathroom is also located on the upper floor which then leads to the master bedroom which features a king sized bed and its own private balcony which overlooks the garden and pool area. Spacious one-bedroom villa with a sea view and central location. All villas have a separate bedroom with king bed, private bathroom with shower only, kitchenette with microwave, refrigerator, 2-burner electric cooktop, coffee maker, and toaster. Villas also feature a dining room with seating for four, living room and private patio. 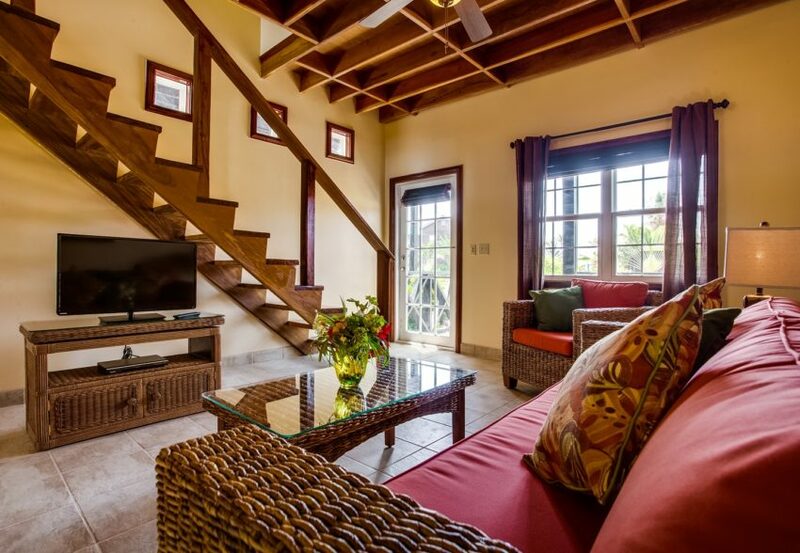 Each villa is centrally air-conditioned and equipped with ceiling fans, and cable TV. Daily housekeeping is provided, laundry services offered and wireless Internet access is available onsite.